The incorporation of the innate immune system into humans is essential for survival and health due to the rapid replication of invading microbes and the delayed action of the adaptive immune system. 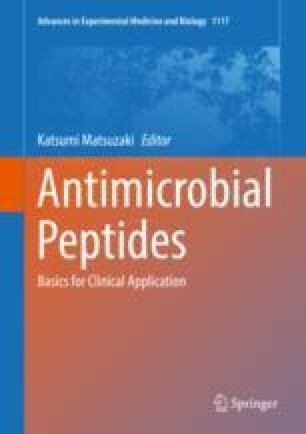 Antimicrobial peptides are important components of human innate immunity. Over 100 such peptides have been identified in various human tissues. Human cathelicidin LL-37 is best studied, and there has been a growing interest in designing new peptides based on LL-37. This chapter describes the alternative processing of the human cathelicidin precursor, protease digestion, and lab cutting of LL-37. Both a synthetic peptide library and structure-based design are utilized to identify the active regions. Although challenging, the determination of the 3D structure of LL-37 enabled the identification of the core antimicrobial region. The minimal region of LL-37 can be function-dependent. We discuss the design and potential applications of LL-37 into antibacterial, antibiofilm, antiviral, antifungal, immune modulating, and anticancer peptides. LL-37 has been engineered into 17BIPHE2, a stable, selective, and potent antimicrobial, antibiofilm, and anticancer peptide. Both 17BIPHE2 and SAAP-148 can eliminate the ESKAPE pathogens and show topical in vivo antibiofilm efficacy. Also discussed are other application strategies, including peptide formulation, antimicrobial implants, and peptide-inducing factors such as vitamin D and sunlight. Finally, we summarize what we learned from peptide design based on human LL-37. This study is supported by the NIAID/NIH grant R01 AI105147 and AI128230 to GW. This chapter reflects the point of view of the authors and may not represent the funding agency.